After being diagnosed with coeliac disease, Charlotte experienced multiple health issues from a combination of this and bad eating routines, causing issues such as ill health and fatigue, which caused a knock-on effect on her studies, social life and general health. 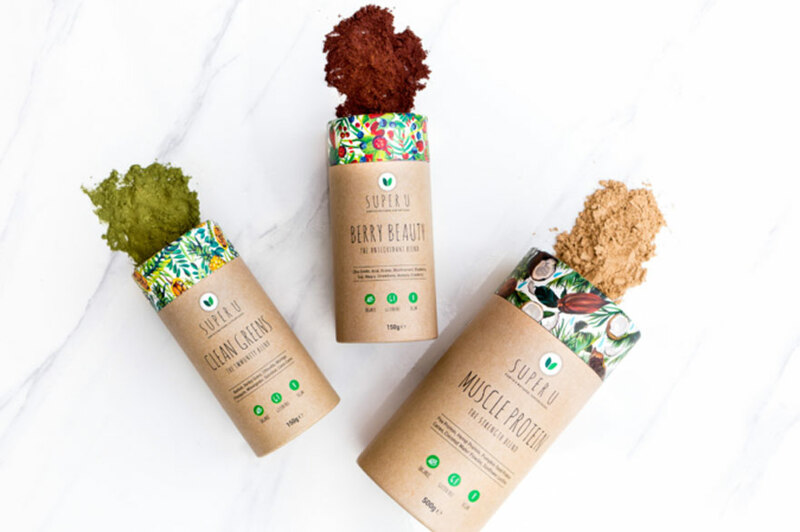 Since, they have launched three powdered superfood blends called: Berry Beauty, Clean Greens and Muscle Protein each possessing unique ingredients with specific health perks. Also creating their own recipe page on the Super U website, which includes a number of different recipes for each blend, for example, smoothies, smoothie bowls, protein shakes and protein balls. Super U is an eco-friendly, sustainable brand, their products are vegan-friendly, organic and gluten-free. Shortlisted as finalists for the 2018 Natwest “Young Entrepreneurs of the Year” award. Finding a supplier for our products that was affordable and could help formulate our blends at a cost-effective price. Did not have the budget for a professional designer so approached Phil Clarke in The Hive who recommended they got in touch with graduate graphic designers from NTU and offered an internship. Doing exactly that, they found the perfect designer, working together all summer developing logos and packaging designs. Super U want to expand their product range further and build a strong foundation of ambassadors on social media. Aiming to be recognised as a successful and trusted health, wellness and fitness brand within the UK and around the world. “Our dream would be to take Super U to America and Australia, as the market and lifestyle out there is exactly what we want Super U to represent”. Also, from Charlotte’s experience of living with coeliac disease and the health issues it entails, they both can’t wait to help other people with similar problems, feel healthy and happy again! Just go for it! What have you really got to lose? Sean and I always had plans to go travelling together after we graduated, and to pursue careers in Australia or America. Sean actually got a job offer to work in London for a year and then to transfer to Sydney, Australia, but he knew if we didn’t give this a go, we would have never known if it would have been successful. If you have an idea that you truly believe in and are passionate about, just go for it!